Keeping up Appearances is a British Sitcom produced by the BBC which ran from 1990 to 1995. It ran for five series consisting of 44 episodes, four of which are Christmas specials. The series was written by Roy Clarke and centres around the life of the eccentric social climber Hyacinth Bucket. The sitcom follows Hyacinth in her attempts to prove her social superiority and to gain the approval of those she considers upper-class. These attempts are constantly thwarted by her extended family who are decidedly lower class and whom she desperately wants to remain hidden. 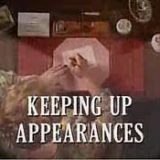 It was confirmed by BBC Worldwide that Keeping Up Appearances is the corporation’s most exported television programme and has been sold nearly 1000 times to overseas broadcasters. 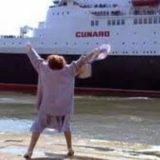 Sea Fever – Hyacinth and Richard prepare for their luxury stay on the QE2. They have a disastrous start to their holiday and manage to miss boarding the ship. They finally board the ship by flying to meet it at Copenhagen, Denmark. Once aboard the ship, Hyacinth has reason to believe Onslow and Daisy are also on the luxury liner – as stowaways. Daddy’s Accident – Hyacinth’s “Daddy” is put into an ambulance and taken to hospital, and Hyacinth is shocked when she hears why. 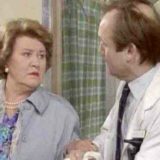 After visiting him, Hyacinth returns home and is visited by the electric man. Finally, Hyacinth has to fend off the amorous advances of “The Major” in his greenhouse as she picks up flowers for her latest candlelight supper.